Anyone who's a tinkerer has many hard drives sitting on their shelves from older systems. 120 G gets replaced by 250 which gets replaced by 500 and so on. And one doesn't really throw away old drives. 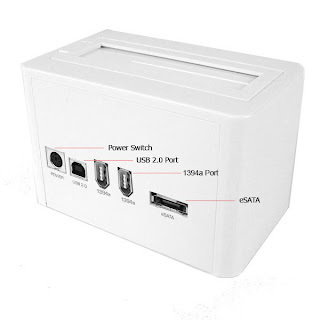 At the same time, connecting a SATA drive inside a case or even inside your PC/Mac is cumbersome. Screws, connectors case lids - too much hassle. So, I checked out a USB to SATA/IDE adapter some time ago. A friend, sent me a link. I bought mine on eBay. Rs 800 and very innovative. It works fine, but can be a bit cumbersome. Too many connections to make just to connect a drive. And the SATA connectors come loose any time. So the experience is only marginally bettter than connecting a bare drive to a computer or external case. Then last month while in London, I bought this a USB drive dock. From Maplin at Tottenham Road. This is really terrific. Bare drive can be just slid in 'browsed' and slid out. Push a button and the drive pops out like toast. No screws no connectors. Just keep the dock permanently connected to your Mac or PC. Even MacBook Pro. My dock sits on my table permanently connected via USB to my MacPro at work. And a drawer full of drives, now working like floppies. It even works with laptop sized 2.5 in. drives. I even got another through a friend who went there last week. 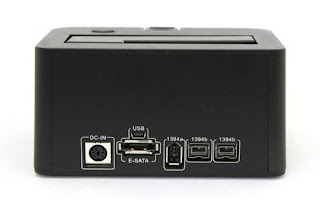 A USB/SATA drive dock with a card reader and hub. Also from Maplin but at Wembley. I could get used to this place. This has a SATA port. And a card reader and USB hub. 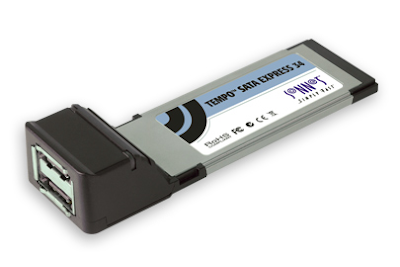 And to connect it to my MacBook Pro via eSATA I have a Sonnet TempoExpressCard SATA adapter. It gets even better. If you want Firewire and can spend a bit more, Vantec makes one with Firewire. And like me, if you're worried that the drive is exposed from the back check out the one with a case. And a final twist, one with a fan. Bear in mind that these things are a bit heavy. They have weights in them, else when the drive spins they'd fly. As a curious experiment try this. Connect the drive, and let it mount on your Mac. Then browse through folders, open and close a file or two. Then, unmount the drive, after its gone, switch off the dock and pop out the drive and hold it in your hand. The drive is now spinning down from 7200 rpm to stop. The sheer torque it generates twists your hand like an unseen force. 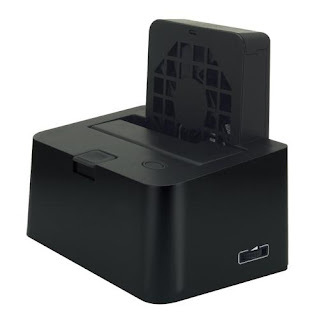 "Note: In order to keep still, the docking station has added weight this preventing the docking station to move when you are plugging in or out your HDD. This added weight is unfortunately increasing the shipping cost… We are very sorry for this inconvenient but there is nothing we can do on this matter. Thank you for your understanding." The English is quaint, but this thing works. Recommended. 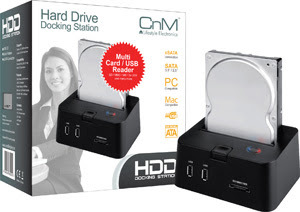 If you can afford it get the version with Firewire and cases for your drives. Shooting a feature length Indian film with a Red camera is now a possibility. Cameras are coming in, and hiring them is getting easier. Some have already done it. And many more are testing the waters and mulling it before taking the leap. Apart from all the other arguments and discussions on the aesthetic of Red vs. film, the post workflow is a different. And if the Red camera saves you money from not having to shoot hundreds of cans of film negative (each costing about Rs. 10,000), it also needs you to be responsible with the storage of this data. And have a good plan on how to finish the film. So, for all those who are considering shooting on Red, here's a check-list of gear you must own or have access to. For the post of a movie shot with the Red camera. Firewire CF Card readers - two at least. A good utility like ShotPut Red for copying and backing up these files. Safe RAID - Sonnet Fusion, CalDigit, anything running RAID 5 or RAID 6 for which you can get failed drives replaced in India easily. And with 5 drives or more. Licenced software - FCP, Crimson, GlueTools, Pomfort. Red software - RedAlert, RedCine, RedRushes. The latest versions tried and figured out. Large monitor - Apple or some other 30". Small monitors are a disaster. Capture card - BlackMagic or Kona Broadcast monitor - or good LCD TV. All Software - Buy, Buy, Buy. Don't look for cracks, don't pirate. All this can go between Rs 7-10 lakhs. If you don't want to sink in that kind of money figure out rentals with a post house. Or installments with a bank. But do NOT skimp on any of these. Red shoots data. On CF cards. Your rushes are data. As long as your data is safe you have a movie. If your data is lost, only a re-shoot can get it back. And till you re-shoot, you don't have a movie. With Red data, a drive failure can make you lose 20 hours of rushes in a fraction of a second. Especially with cracked software. Now is Rs 10 lakhs too expensive? So develop a paranoid, maniacal reverence to data and obtain a obsessive compulsive disorder of continuously making backups and triple-checking them. Once per hour. Next, get a good post crew. Identify an editor. Have him or her improve their reading on digital formats and get familiar with the Red workflow. And all the products listed above. Avid or FCP doesn't matter as long as the editor has a good plan. If the editor is Red-skeptic, get another editor. Repeat this process till you find one who believes. Make sure your editor's plan is in sync with the people at the post house that is doing the final film grade and output. Again, both the editor and the post house need to believe in this whole thing. If they are skeptical, or in a Red-bashing, or FCP-bashing, or Avid-bashing or general digital-bashing mood, let them go. The editor's age doesn't matter as long as his thoughts and beliefs are from this century. Yes, even twenty-somethings can be really old school when it comes to the Digital Film process. Finally, identify all the deliverables - film print, promos, trailers, HD tapes, DigiBeta tapes, DVD, maybe Blu-ray - and ensure the editor and post people have heard of all these and have a plan on starting with Red and ending up with all these. Actually your post plan also depends on the final deliverables. If your post team don't have a plan, find a consultant (hint, hint) who can sell you a plan. Yes, sell a plan, as in pay money and get something in return. The goods you're buying is advice. Don't expect free advice. Most consultants treat free and paid advice with different degrees of seriousness. So if you have the intent (to pay), make it known up front. Making a film and completing it so that people can buy tickets and watch it, all this starting with a film camera and film, is easy. If you and your crew know how to, can follow instructions, and have a plan. 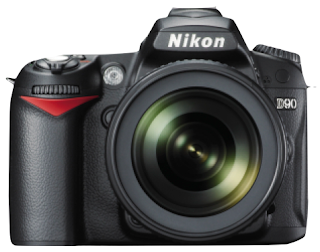 The same applies to starting out with a Red camera and CF cards. Except that the instructions are different, as is the plan. DI colour calibration - does it work? The edit is handed over to the DI facility as data - EDLs, cut lists, whatever. And a reference movie for comparison, on tape or as Quicktime. With these, (the EDLs) the film is scanned. Scanning is a semi-dumb process. No colour correction, simply film to disk 'transfer'. No art. After scanning, the scanned frames are and 'conformed' to the EDL. Meaning a sequence is made and compared to the original edit. This sequence is graded. meaning colour corrected. A look given, effects, graphics added. All the Art happens here. While grading one looks at the picture projected on a large screen through a projector connected to a Truelight Colour management system. Or some other software or hardware. After grading, the graded sequence is rendered out. As a large collection of frames. The render files are recorded back to film on an Arrilaser recorder. or some other. 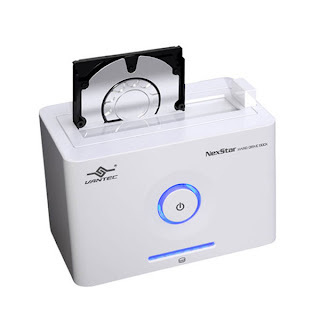 While recording, the film recorder also prints out test charts which are measured for density and accordingly, printer lights set to make prints at. Normally one uses one constant printer light settings for an entire reel. Now, if, for some reason, one takes this DI output negative, and works it in a traditional optical analyzer system, grading it all over again, as it were, then the results are unpredictable. It could be great it could be awful. No bets. Should never be done. After DI it is crucial to see the print carefully and suggest changes if any. And, involve all those, who will be assessing the film qualitatively, at this stage. Any grading decisions that aren't satisfactory, should be regraded, re-recorded and inserted into the negative. After the negative is struck, there is only so much that can be done in making a print. If you then feel you wish the film to look different, you almost cannot, by just printing it different. So, it is possible to calibrate any grading system and projector show pictures that translate accurately to film as a DI negative and subsequent print. And, its generally no advisable to grade a DI negative on an analyzer. Some facilities do it, but, at the very least, it goes against the very spirit or reason for DI. These days I've been getting a lot of queries on this - media repurposing. Sounds like a new buzz word, but this can become serious business in the next few years. Media repurposing consists of taking existing media - 35mm print/neg, DigiBeta/BetaSP/U-matic/VHS/DV tapes, an other media - and converting them to a format more friendly to new media vehicles. And playable on mobile phones, portable media players, or sent over a wire or wireless to homes and offices. IPTV and VOD are two such new vehicles. IPTV is Internet Protocol Television and VOD is Video on Demand. IPTV consists of sending video to viewers over the normal Internet. In India MTNL (and other services) show many cable TV channels over their broadband internet line - sent to homes over a telephone line. VOD is when a viewer can go through a menu or index, and choose what he/she wants to see. That content is then played immediately, or downloaded over the Internet or wireless to view later. Where IPTV and VOD differ from normal TV is that in normal TV many TV channels are being broadcast simultaneously all the time over a cable. In IPTV, only the channel the viewer wants to see is transmitted. In VOD, only the actual program the viewer wants to see is beamed for as long as the viewer wants to see it. So VOD is sort of like watching a movie on a flight after selecting it from a menu. Like movies downloaded over the iTunes store for AppleTV. Or, in India Movies on Demand from Eros. But Eros's Movie on Demand only work with PCs as it needs to detect Windows Media Player, which no Mac has. So if you have a MacBook, or iMac or any other Mac, forget Eros. Other VOD examples are, of course, YouTube, or for really good-looking movies, Vimeo. While repurposing media, it is also possible to break the programme down and classify it intelligently - like chapters in a DVD so viewers can see a portion of the entire programme. Like songs in a Hindi movie, or important scenes. Or like innings or overs in a cricket test match, ODI or T20 match. How about going through a list of Hindi film songs and narrowing that down to Shahrukh Khan-Rani Mukherjee songs and selecting one you'd like to see. Or through a list of cricket matches and selecting one of Sachin's heart-breaking nineties collection. Or centuries by Rahul Dravid. Reliving that World Cup semi-final 2003. Whatever. And whenever. Without having to see a TV schedule. To get to this level of choice to a viewer, one would have to convert tapes and films of entire movies or match coverages to digital files. And along the way, or after digitization, intelligently break down these files or 'mark' them with interesting 'chapter points'. In India there are quite a few parties who own or have access to many thousands of hours of programmes - entire feature films, TV serials, cricket matches. And now want to convert them and make them available to users in the future via new media vehicles like Internet, Video over mobile, DTH TV (Tata Sky and DishTV), cable set-top boxes and other future 'pipelines'. The challenge in repurposing media is to work out systems and infrastructure that can handle an initial load of thousands of hours while still being commercially viable handling the lower ongoing load over time. Meaning you might need a certain number of systems and infrastructure to convert and classify, say, 10,000 hours of programming in a reasonable time of, say, 3 months. But after that is done, new programing may need to be converted at only 1000 hours or less per month. This earlier infrastructure is too large for that small a load leading to wastage. The trick is in creating an ideal size of setup that can do both. The other issue is standards. What file format does one convert to? MPEG-2, H.264, VC-1, WMV, Flash...? Many formats exist. And the servers that handle and deliver these files also work with one or more of these standards. So the delivery vehicle and its standards dictates what the encoding is done as. But typically, encoding to either of these formats is a one-way street. Meaning if one does the conversion, then changes the delivery architecture or provider, and a different standard is needed, then cross-conversion is not lossless and can even ruin the picture. So, typically, converting to a low loss intermediate standard first then the final compression can permit some standards independence. Or, of course, one can convert to multiple standards and keep all available. There are other challenges - secure storage, Digital Rights Management (DRM) or anti-piracy, restoration before repurposing, edit-ability of converted material. More on that sometime later. Everyone knows they have to back up their work. Nearly everyone has lost some data from drive or computer failure. Almost no one makes backups, or at least not often enough to make a difference. And when you really need a backup, the latest one is usually the only one of value. And mostly if its over a week old, its useless. I've been in this as well and have somehow managed to find one possible solution. This is 'a' solution not 'the' solution. And I've been using it for a few months now. It ships with every LaCie hard disk on a CD. But you can download it at the link above. And its free. Very simple to use. Just decide which folder should be backed up. To where it has to be backed up - usually a Firewire or USB hard disk. And make a schedule for the back up. Mine is 9 am every day. Yes, every single day. On the first day, it takes a while because all the stuff on the folder you specify is copied to the target. The next day and thereafter, only files that have changed are copied and overwritten. Overwritten, remember. Files you delete from the folder you're backing up are deleted off the backup as well. So the backup is always an exact clone of the original. You can change this delete behaviour with one setting 'Never remove files'. I've done that. And you can specify excluded items. So I've marked 'Documents' for backup, but excluded 'Final Cut Pro Documents' from the backup. You can decide to make multiple copies. So it you set that to 5, Silverkeeper will back up and make a new set each day, but keep 5 sets, deleting the next oldest one in rotation. I've not used this option. Besides backing up data, a good backup solution should also help in restoring backed up data. I had occasion to test that. When I upgraded my MacBook Pro to Leopard I did 'Erase and Install'. So I lost everything - photos, music, videos, documents, Mail, FCP projects. After Leopard installed, I just connected my backup drive and copied the backup folders in their appropriate places, and had my old MacBook back. I chose to do this manually as I wanted to pick and choose what I wanted back. Great way to get rid of clutter. But there's also a restore option that does this for you. Very simply, LaCie Silverkeeper works. At their site LaCie say it works with Tiger up to 10.4.11, but not with Leopard. I'm using it with Leopard on my laptop. Seems to work. But then Leopard has Time Machine. I've yet to try that. Silverkeeper only works on a Mac. For Windows, there's 1-Click also free and from LaCie. This too is on the CD that comes with every laCie drive. once, but I must confess I didn't give it much time since I was already using Silverkeeper and it worked for me. Again, backup is important, everyone knows that. With Silverkeeper, the excuses to not backup just reduced by one. A new online shopping site based in New Delhi, India. My film maker friend Dev Benegal, who's from Delhi, but spent a larger part of his life in Mumbai, recently pointed it out to me. Autsun.com, have a rather nice variety of things. I've checked out only the computer and electronics portion, but that is growing. That's because, what makes this site different is that if you don't see what you want, you can recommend it along with a preferred price. And they try to get it and offer it for your price. I wanted to see a Canon HV-20 - fast becoming a cult camcorder in the indie film circuit - so I recommended it. And they now have it. Available in India, free shipping anywhere in India, the Canon HV-20 for just Indian Rupees 70,000.00. A lot of people will Google the HV-20 and come across prices like US$ 800, even 750. But hey, that's for the NTSC version. The PAL version is US$ 1200 at least and that's before taxes. Add Indian Customs Duty and it gets to 70k anyway. Earlier, my friend Dev recommended autsun.com a Western Digital MyBook Studio Edition 1 Tb hard disk, and they now have it there. 1 Tb for under Rs 16,000 or so. Great for video editing and backups. It has Firewire 800, USB, eSATA and is small. Autsun also sell iMacs, MacBooks and other such. Another interesting item is the Sony HC 96 camcorder. autsun.com is the only place I've come accross this camcorder. No Croma, no Sony showroom, no Vijay Sales. No one has the HC 96. What's special about the Sony HC 96 is that it is the only DV camcorder left that has DV in and out. The other models like the HC 36, 26, 38, 28 whatever, all have analog out, DV out, but no DV in. And no analog in DV out. What's called 'analog in, DV-passthrough'. And since the HC-96 is a Sony it will play back miniDV and DVCam tapes. 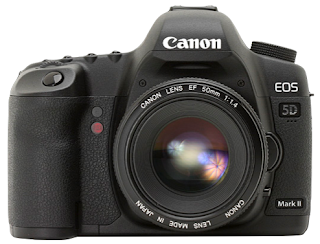 Canon, Panasonic, and JVC will not play back DVCam. So if you need a good capture deck for DV/DVCam for film editing, and have the ability to capture live from a analog source into your MacBook on location (like a video assist) then the HC 96 is the only current camcorder that can do it. And as far as I can tell, only autsun has it. I just realized that don't know these guys from Adam (or Eve) and have not yet bought anything from them, but I'm still recommending them. So please speak to them, do your research, and make your own choices.